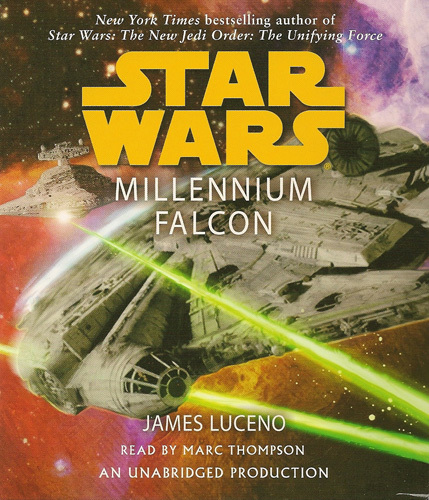 The Star Wars audiobook has been around for a long time. I use them often to illustrate the evolution of the audiobook: they started with two cassette abridgments, moved to CD, then the abridgments got longer, and now, as we are seeing the rest of the industry move (nearly) completely away from abridged audio, Star Wars novels are now… unabridged. Marc Thompson does the reading here, after a very long stretch of excellent Star Wars narration by Jonathan Davis. The series is in good hands. Marc Thompson is a bit of a impressionist, able to invoke Harrison Ford’s Han Solo merely by the tone and meter of his voice. Most of the time it works great, but every now and then I got a clear view of David Puddy in my head (Elaine’s boyfriend from Seinfeld, played by Patrick Warburton). Who knew that Ford’s and Warburton’s voices were so near each other? These times are few, though, and Marc Thompson is a narrator I’d listen to any time. Star Wars: Millenium Falcon spans a lot of history. The famous ship has been around, and James Luceno takes us on a tour of its busy life. Han Solo and Leia are married, for those who haven’t been keeping up, and have grandkids (yes, a LOT has happened), one of which is named Allana. One day she asked Han about the history of the ship, which prodded him into looking more into it. In the meantime, a previous owner of the ship (before Lando) has been in stasis for quite a few years. He wakes up and immediately goes after something he left on the ship. Eventually, their paths cross. This is an entertaining adventure that ties together the whole Star Wars saga through the history of the Millenium Falcon. It’s extremely well done, and lots of fun for a fan like me. The one thing I really dig about the STAR WARS universe is how the official licenced stuff is all one big tapestry. BTW we have a new STAR WARS AUDIO features page!